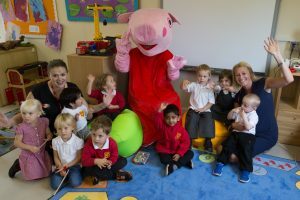 PEPPA Pig made a special guest appearance at Barnsbury Primary School last week to officially open the new nursery. The pre-school TV character was on hand to cut the ribbon and open the extended learning provision. There was also a special Peppa Pig cake and storytelling to celebrate the occasion. It’s been another incredible success story for the south Woking-based school, which was only formally given the green light by the Department or Education in July 2016 following, reportedly, a central processing backlog. The new nursery is non-selective and caters for children between the ages of two to four. For added convenience, it is based on the grounds of the Primary School’s site on Almond Avenue. Clare Spires, Headteacher at Barnsbury Primary School, is delighted with the continual progress and opportunities now available for pupils. She said: “Following our application and months of preparation, it’s great to see that our first intake of pupils are settled and are enjoying the brand new nursery facilities. “We have already received very positive feedback from families expressing how pleased they are to have a local nursery facility; one that mirrors the same values and ethos of the primary school. “The interest has far exceeded our expectations, as the nursery is already half full and we are having new applications arriving on a weekly basis,” added Mrs Spires. Such is the interest in the new 24-place nursery, some parents have moved their children from other service providers to Barnsbury Nursery to help ensure a smooth transition from foundation years into key stages 1 and 2. Sarah Collyer, Nursery Teacher at Barnsbury Primary School, said: “It has been an exciting and busy few weeks getting the nursery set-up and ready, but it’s has been so rewarding to see the children come in and explore their new learning environment with so much enthusiasm. “Children learn a lot during their foundation years, so having the opportunity to hone their skills at such a young age will stand them in good stead for the future,” she added. Following the refurbishment of the former self-contained music room, the new nursery suite now comprises a secure in and outdoor learning area, which also houses changing facilities, bathrooms, a kitchenette and a storage area. For more information, or to apply for a place at Barnsbury Nursery, please visit: www.barnsbury.surrey.sch.uk or call 01483 763114.